Do you have a busy schedule? Are you always working till late that you don’t have the time to go for a movie? Well, worry not! 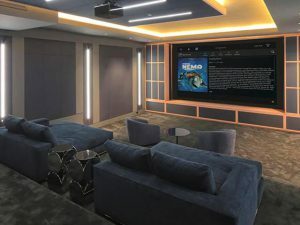 Now you can enjoy a movie theater-like experience right within the confines of your four walls. Just invest in a home theater and enjoy a vast screen with enhanced sound quality. We, at JMG Audio Video Inc., are one of the greatest companies which offer high-quality home theaters equipped with the state of the art technology. We can set up an entertainment room in your house which will become everyone’s envy. We are known for our high-quality and smart products along with affordable pricing. So, if you are from areas such as Franklin Lake, Alpine, Ramsey, Wyckoff, Tenafly, or Saddle River, you can resort to us without any hesitation. Here, we have put together a few ways in which you can find the right home theater company. Take a look. First of all, you should consider a number of companies for the home theater system. Always shortlist a few depending on the experience and the reputation they have in the market. Now, you should check out their products and facilities to decide better. Next, you should do a little research on your own regarding some of the right brands for the home theater systems and check which companies are offering you those brands. Go through the online reviews and ratings of the company to make sure you are taking the right decision. Everyone has a set budget for their home improvement products. You need to make sure that the home theater you are considering is feasible for your pocket. So, you must take quotes in advance and then compare them to pick the one which offers the best quality at the lowest prices. And if you think we can be the right choice for you, then you must contact us now.